A reply to Mr. Gibbon's Vindication of some passages in the fifteenth and sixteenth chapters of "The history of the decline and fall of the Roman Empire"
A reply to Mr. Gibbon's vindication of some passages in the fifteenth and sixteenth chapters of "The History of the decline "and fall of the Roman Empire." 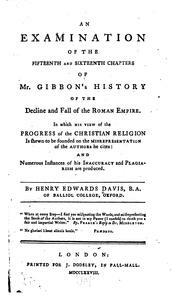 ... By Henry Edwards Davis, ..
An examination of the fifteenth and sixteenth chapters of Mr. Gibbon's History of the decline and fall of the Roman Empire. In which his view of the progress of the Christian religion is shewn to be founded on the misrepresentation of the authors he cites: ... By Henry Edwards Davis, ..
Are you sure you want to remove Henry Edwards Davis from your list?